The newest high-tech innovation that combines the best of medicine, bio-informatics, electrical engineering and other sciences. Applying quantum medicine as the theoretical basis, this advanced electronic equipment collects the weak magnetic field of human cells for scientific analysis, thereby analyzing and determining a person's health status and main problems and putting forward standard prevention recommendations. By holding the sensor in your palm, hundreds of health data will be obtained from your body within minutes. 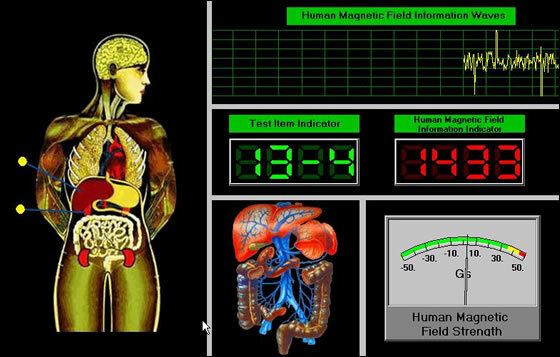 The Quantum Bio-Electric Whole Health Analyzer will produce 41 easy-to-understand reports reflecting various conditions of the body's health systems. The analysis will tell you the condition of your client's health without blood analysis or radiography. No Radiation - No Blood Drawn... Health Reports Produced In Just 2 Minutes. Quantum Bio-Electric Whole Health Analyzer is an ideal diagnostic tool for medical offices, chiropractors, nutritionists, energy workers, health consultants, and more. The Quantum Bio-Electric health Analyzer may also be suitable for home use.